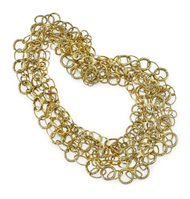 One 18kt yellow gold multistrand necklace. This piece is composed of 9 individual link chains terminating in a “bar” clasp. The 20–21 inch necklace “swags” in a free form style. This is a Jorge Adeler custom designed piece.